Everyone is "Smitten" over this super-clean 45' Sea Ray 2013 for sale! : Atlantic Yacht & Ship, Inc.
Everyone is “Smitten” over this super-clean 45′ Sea Ray 2013 for sale! 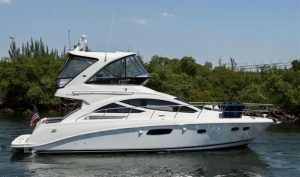 Word from Dennis Rhodes brings news of an $80,000 price reduction on this used 45′ Sea Ray 450 for sale! In the first place, this beautiful used 45′ Sea Ray 450 is known as “Smitten”. Overall, since she was recently launched in 2013, she is in outstanding condition. In fact, after being purchased new in 2014 she was taken directly to fresh water. She enjoyed living undercover in fresh water until May of 2017. This results in extraordinary condition as can be seen by how her gel coat glistens! In short, you will love how this used 45′ Sea Ray 450 is loaded with options and upgrades. Moreover, powered with twin Cummins T-480 diesel engines this is a fun and fast cruiser. Furthermore, these engines are paired to pod drives which gives you joystick control. These are truly state-of-the-art! Additionally, this boat has some options that are usually found on much larger yachts. This includes features like a water maker, hard top, and bridge air conditioning. And that is just the beginning! For more information on this beautiful used 45′ Sea Ray 450 for sale in Florida contact Dennis Rhodes today! This beautiful used 45′ Sea Ray Sedan Bridge 450 is seriously for sale! Don’t miss this beautiful used 45′ Sea Ray yacht for sale! $80,000 price reduction on this beautiful used Sea Ray 450 for sale!